Cones on Douglas-firs this year! Douglas-firs (Pseudotsuga menziesii), along with many other conifers, produce a heavy crop of cones only once every several years, in cycles. A cycle for Douglas-fir cone production is typically 5 to 7 years long. Once every 5 to 7 years, Douglas-firs produce a heavy crop of cones. On the in-between years, Douglas-firs produce a far lighter crop or even no cones at all. Last year, in 2017, as far as I could tell there were no new cones on Douglas-firs whatsoever (at least where I live). I assumed that 2017 was just a down year in the cycle, but who knows ... maybe the sun won't rise tomorrow. What are we seeing here? many preexisting needles and twigs. Press here to learn more about seed cones and pollen cones. So Douglas-fir cones are appearing in 2018. The green seed cones (female cones) are far from abundant, but at least I saw a few on several different trees. My guess is it'll be a light-cone year. A relatively small number of green seed cones (female cones) means a correspondingly small number of seeds and, eventually, a small number of seedlings/trees that will be "born" in 2018. 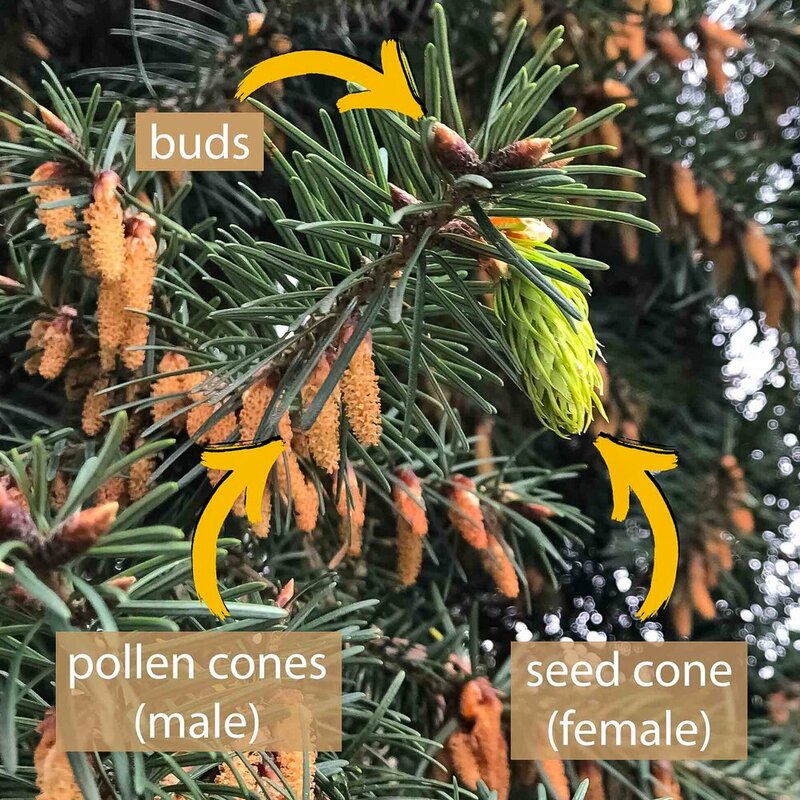 Pollen cones: The Douglas-fir pollen cones (male cones) have either released their yellow dust-like pollen or are just about to release it. I've noticed a fine yellow dusting of Douglas-fir pollen on the deck outside my back door. Seed cones: On the Douglas-fir seed cones (female cones), all that are visible are the bracts that will turn into "mousetails" familiar to kindergarten students throughout the Pacific NW. Press here to learn more about bracts on cones. Today, the seed cones (female cones) are as soft as a paintbrush. At this stage, the seeds within the seed cones are either (i) not yet in existence, or (ii) tiny at most. Within a few weeks or so, the seeds will be developing and will continue developing until they mature in the fall of this year. Cone scales will form, with one cone scale covering every two seeds. At that point—maybe in a month or so—the cone scales will be prominent compared to today (when cone scales are not even visible). Later in the summer, try taking apart a Douglas-fir seed cone (female cone). You can do it with just your thumbnail, or perhaps with the help of scissors. Pry a cone scale outward to reveal the two seeds developing underneath. You will see that each seed is winged, with the wing several times as long as the seed itself. Read more about this here. 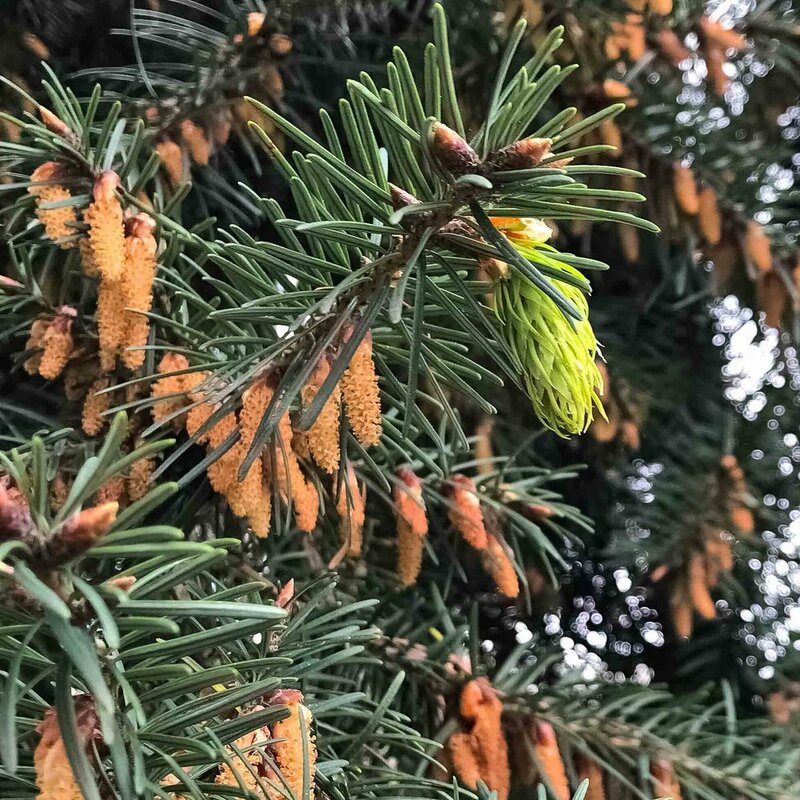 Questions that are not fully understood yet include (i) why do Douglas-firs and many other trees produce cones in multi-year cycles as opposed to the same amount every year? and (ii) how do trees communicate with each other to coordinate their "plans" for cone production? Meanwhile, keep your eyes open! Mother Nature is full of surprises. Newer PostWhat are those tiny brown cones that are covering my driveway?